We enjoyed the best of both worlds today with Yellowfin Tuna and Cobia. A fun day! Here is Mike Martin with his 83 lb Yellowfin Tuna along with Sam Adair (left) with his 77 lb Yellowfin Tuna! Both fish are citations! Congratulations! Offshore fishing for the Oregon Inlet fleet was fantastic today but we stayed inside today for our annual spring Cobia trip! An INCREDIBLE day with wonderful friends! We had a great catch of Dolphin offshore today and enjoyed time inshore catching Cobia. Fun day!! Went offshore for a few Tuna and Dolphin and spent the rest of the day looking at Cobia! We had a good chop on the seas and a hard wind but didn’t go down without a fight. Nice work for the day! The weather conditions weren’t good for offshore today so we went fun fishing for Cobia. Had a FANTASTIC DAY with family and friends! https://www.fishthepelican.com/wp-content/uploads/img_0880.jpg 960 1280 Summer Bracher https://www.fishthepelican.com/wp-content/uploads/2018/11/pelicanlogo-circular-3-300x300.png Summer Bracher2017-05-26 18:11:162017-05-26 18:11:16Cobia Fun Fishing! Today the guy’s decided to go Cobia fishing and it was certainly an excellent decision! Pretty work Team Braxton!! 47 lb Dolphin! Five Sailfish Released!! What an incredible day!! Five Sailfish released on the Pelican today! Along with landing a citation 47 lb Dolohin!! We ended the day waving flags and stacking fish in the box. Congratulations to a great crew! https://www.fishthepelican.com/wp-content/uploads/img_2137.jpg 1280 960 Summer Bracher https://www.fishthepelican.com/wp-content/uploads/2018/11/pelicanlogo-circular-3-300x300.png Summer Bracher2016-05-24 20:46:552016-05-24 20:46:5547 lb Dolphin! Five Sailfish Released!! 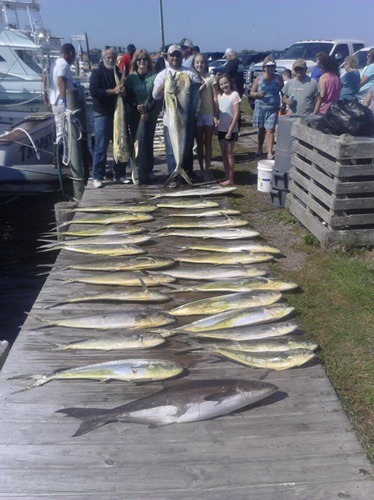 Mahi, few Tuna and Cobia! Great day! Today the Pelican stayed at the dock while this southwester’ blows through but here’s a photo from yesterday’s big catch.